This Monday out on the Bonneville Salt Flats of Utah, an electric vehicle broke the land speed record for EVs with a two-way average speed of 341 mph. The vehicle, called the Venturi Buckeye Bullet-3, or VBB-3, was developed and built by a team of engineers from Monaco-based Venturi Automobiles and The Ohio State University. The third iteration of the Buckeye Bullet uses two electric motors that can put out 1,500 horsepower (1,119kW) apiece, powered by eight lithium-ion battery packs. 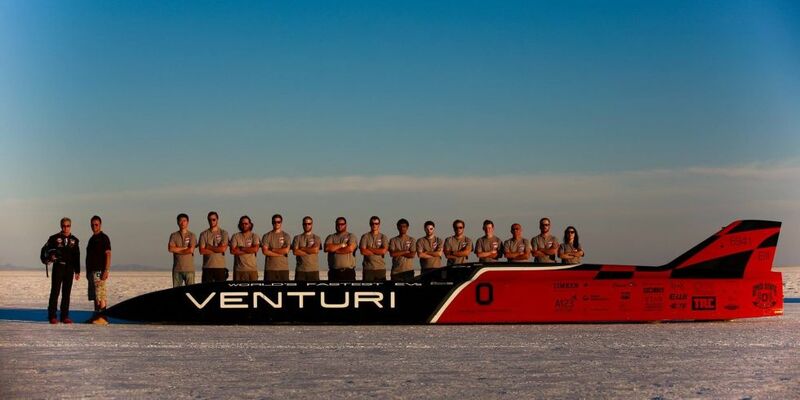 The OSU-Venturi team has been chasing 400 mph for more than half a decade now. They set the previous EV land speed record at 308 mph back in 2010, but poor salt conditions and mechanical challenges have prevented them from besting that record until now. Last year, the team was forced to abandon their attempt at a new record after a bumpy track caused a welding crack in the coolant tank of VBB-3. By upping the shifting point to more like 10,200 rpm, and possibly decreasing the shift delay time (which is currently at a conservative few seconds), the team hopes to continue pushing the limits of what an electric dragster can do. Here’s to 400 mph.